Adam Conley is only in Fly Creek for as long as it takes to fulfill his promise to his late cousin. The small town brings up too many memories of the life he left behind years ago. He knows his task won’t be easy, but the last thing he expects is the instant attraction to the reason he’s in town. Emily is beautiful, vibrant, and completely off-limits. He’s there to keep his promise—not fall in love. But Adam’s secret will crumble everything Emily’s life has revolved around. I'm super excited to tell you all about this fantastic new release! Her Cowboy's Promise is a fantastic book, one that I couldn't wait to start and was perfect first read for my summer vacation. The first really big thing that stuck out to me about this book is that you don't get every piece of the puzzle up front, you have to keep reading to actually find out what happened to the main character Emily. The best part of that is that it wasn't what I had thought, actually I couldn't have predicted what the truth was! Which of course makes this an amazing plot/book. 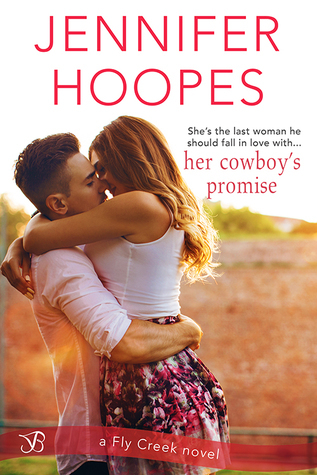 Author Jennifer Hoopes writing style was perfection and made reading Her Cowboy's Promise an easy and fun read. It’s one that had me engrossed into the story right away and that’s due to her writing style and plot. Of course I was on the edge of my seat waiting to find out if she was going to come out of her shell and fall in love. You all will have to read this book to find out, because you all know I don't do spoilers. Let's just say you won't be disappointed. Though at times I wasn't too sure what was going to happen. I really enjoyed the connection between these characters and how much the town really pulled for Emily. That is one thing I will mention the town in this book was one that I wouldn’t mind living in myself. Everyone knew who she was and even though she was closed mouthed about who she was and what had happened they still protected her and that to me is amazing. I really loved all the secondary characters as well and you don’t often see that in a book. Don’t get me wrong I love all the main characters, but when you can root for others that makes me as a reader love a book so much more. I hope the author writes more stories with these characters, I need to know more about the others as well. Maybe his brother or Peyton's story. (Hint Hint) . I would defiantly read those books as well. All in all Her Cowboy’s Promise is one that I would recommend to anyone that is looking for a great love story. If you’re looking for a book with lots of twists and turns and one that you have no idea what’s going to happen next, then Her Cowboy’s Promise is perfect for you. There were a bunch of passages that I really loved, but here is one of my favorites. "Of course you haven't. You're from the East Coast where everyone's so afraid of offending someone they swallow the real words they want to say. But no matter now. Your home's here in Fly Creek. You'll get used to me soon enough. Although if you don't mind me saying, you could have already been used to me if you hadn't squandered three years of your life." Here at Ali's Bookshelf we accept books in exchange for a honest review. The book above was given to me for my honest review by the publisher. I also use Amazon Affiliate links at times.